God has emotions? If so, then god has WEAKNESSES, and if god has weaknesses, then he/she/it is NOT omnipotent! If god can be "swayed by their prayers," then how well thought out was his/her/its master plan for this reality, especially considering the content of some of those prayers? If god needs / demands "the saccharine adoration of His creatures," then he is PETTY, a trait shared by LOTS of other gods that have been invented over the years and not an admirable one. Such a god is far less god than it is just an enhanced human, vulnerable to the same kinds of crap that we are and about as worthy of worship as a hole in the head. 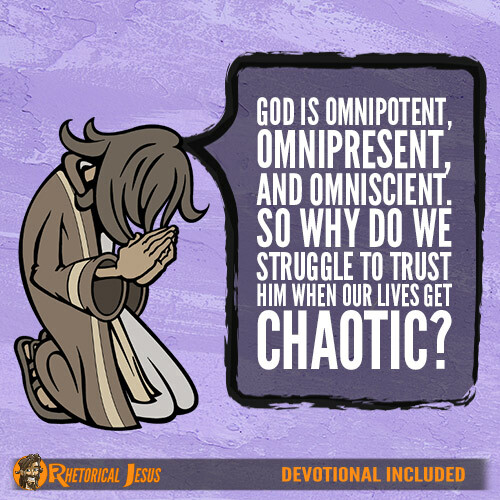 "Why do we struggle to trust him when" there are other options that work more effectively, reliably, efficiently, and have evidence to demonstrate the validity of my claim? I'd much rather try to do something myself. Further thought: what kind of god needs the boot-licking and obsequious attentions associated with worship? That'd be all we'd need: a god with an inferiority complex! There's a Jewish teaching that "God doesn't need prayers; the person praying needs them to know themselves better." Maybe there's something to be said for addressing the hopes and fears and faults and dreams you don't feel like telling another human being, to "Someone". Better perhaps to talk to Ceiling Cat (with a nod to "You'll pray for me? I'll talk to my cat for you"), or to a cat or dog who's actually present, and responds to you, and can give you actual, visible, tangible (if sometimes slobbery, or fuzzy and tickly) affection. In the religions we're most familiar with, why mandate a litany of repetitive asskissing to "Someone" who shouldn't need it? For instance, in traditional Judaism, in addition to morning, noon, and evening prayers, a brief grace before meals, and a long grace after meals, it has blessings of thanks to God for just about every circumstance: on waking up, on going to sleep, on using the bathroom, on wearing new clothes, on eating new foods, on surviving a dangerous trip or recovering from illness (ok, that can be pretty major), on seeing a friend or relative you haven't seen in a year (metaphorically thanking God "who revives the dead"), even on getting bad news, such as finding out about a loved one's death (blessing "God, the true judge"(!? ); mysterious ways and all that).